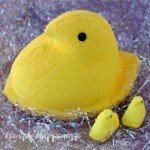 April 14, 2018 By This post may contain affiliate links. 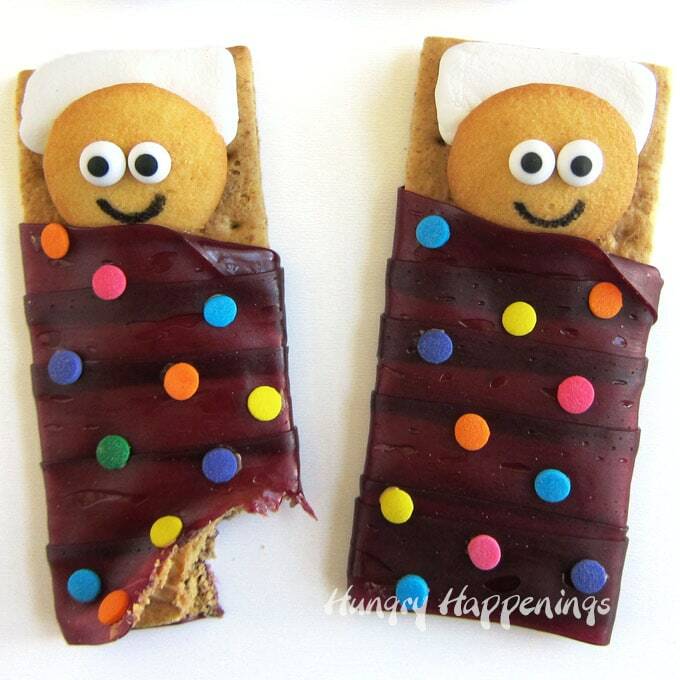 Unroll some fun by making these sweet Sleeping Bag Snacks for your kid’s slumber party. Each little cookie kid is sleeping on a marshmallow pillow and is snuggled in a Welch’s Fruit Roll sleeping bag wrapped around a peanut butter topped graham cracker. 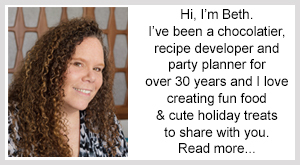 Do your kids love having slumber parties for their birthdays or during school breaks? I remember how excited I was each time I got to sleep over at a friend’s house when I was a kid. Even though I shared a room with my sister and we giggled every night until it was time for lights out, nothing compared to spending the night with a friend or group of friends at a sleep over. There was just something so fun about snuggling up in a sleeping bag and talking until our eyes could no longer stay open. 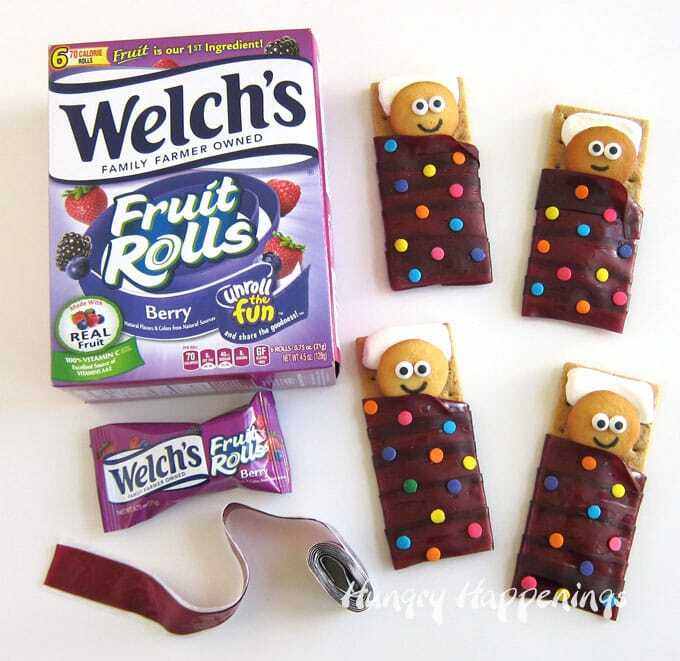 Enjoying snacks was always a big part of the whole slumber party experience and I would have been super excited to have had these Sleeping Bag Snacks made with Welch’s Fruit Rolls served to me at a party. I’m sure your kids will be excited too! Aren’t they just adorable? 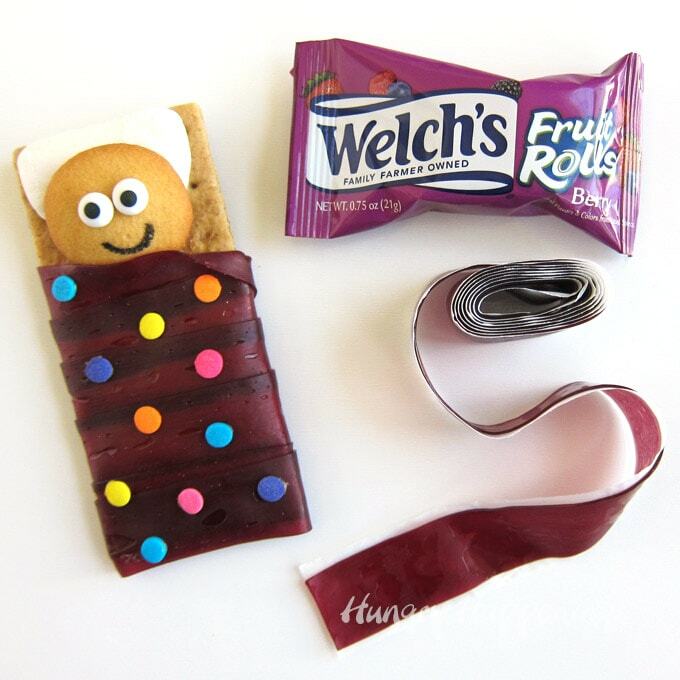 Each little cookie kid is snuggled up in his/her Welch’s Fruit Roll Sleeping bag. The little sleeping bags are so simple to make by wrapping Welch’s Fruit Rolls around peanut butter covered graham crackers. The kids are created by adding royal icing eyes and a smile to a vanilla wafer and each one is resting peacefully on a marshmallow pillow. To add a pop of color you can decorate the sleeping bags with sprinkles. 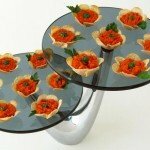 I used round confetti sprinkles to decorate mine, but little hearts, flowers, or stars would look fun too. 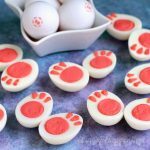 You can make these snacks before the kids arrive for the party or you can set out all the supplies and have the kids put them together themselves. Not only are these snacks cute but they taste great too. The berry flavor of the Welch’s Fruit Rolls pairs perfectly with the peanut butter topped graham cracker. Since fruit is the first ingredient in the Welch’s Fruit Rolls they have a wonderful berry flavor. They also have 100% daily value of Vitamin C and 25% daily value of Vitamins A & E which makes them a great go-to choice for moms, especially for school vacation week or birthday parties. If any of the kids at your party have nut allergies you can swap out a nut-free chocolate spread or cookie spread for the peanut butter. Either of those spreads would taste great on these Sleeping Bag Snacks too. You can find a coupon for your next purchase of the Welch’s Fruit Rolls at Walmart, Kroger, or your local grocery store, here. Use peanut butter to attach two royal icing eyes to a vanilla wafer cookie. Draw on a smile using a food coloring marker. Cut a pillow from the marshmallow and attach it to the top edge of a graham cracker using peanut butter. Spread peanut butter down the center of the graham cracker and smooth it out along the edges. Attach the cookie head to the marshmallow pillow using peanut butter. Unroll the Welch’s Fruit Rolls and cut them into 5 equal size pieces. Wrap 5 strips of the Fruit Rolls around the graham cracker forming a sleeping bag. Fold down the top strip to look like the opening of the sleeping bag. Optional: attach sprinkles to the Fruit Roll sleeping bag using peanut butter. Serve at your slumber party! 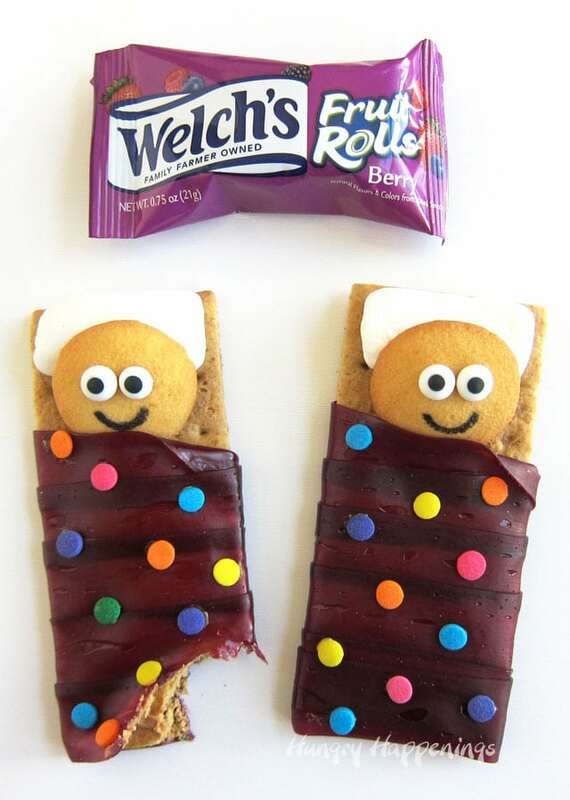 Have fun making these Welch’s Fruit Rolls Sleeping Bag Snacks for your slumber party. 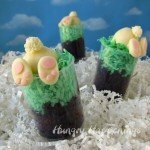 If you make them and share them online be sure to link back to this blog post, mention Hungry Happenings, and use #hungryhappenings. Thanks! 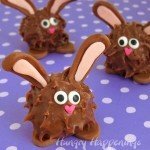 Oh my goodness, these would be so fun to serve at sleepover! They’re just adorable. Who would think of such a cute snack using the fruit rolls, graham crackers and peanut butter except you? Thanks for the photo and instructions. 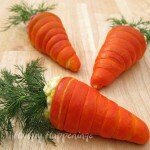 Kids would love these. Makes one want to run out and buy the fruit rolls right now – forget waiting for a sleep over. I am so happy you popped back up to the top and read my post. I often wonder if anyone is reading them! LOL! I think the most fun I ever had at a slumber party was when my friend’s mom taught us how to make Buckeye Bars (peanut butter fudge topped with chocolate ganache). Having great snacks always made the night even more fun.